Last night’s debate was a different format, arguably a different tone, and started out in the wake of what many pundits have dubbed a political “bombshell” for Donald Trump’s campaign. However, our observations of Twitter chatter, and parsing out Twitter sentiment with our debate analysis partners at Kno.e.sis and Cognovi Labs, told a very similar story to the first debate. Last night’s debate broke the record for “most tweeted debate ever” clocking in at over 17 million tweets about the event, according to multiple news sources. Cognovi's tool, powered by Kno.e.sis's Twitris technology, pulled in that Twitter chatter and saw roughly the same trends as the first debate, with a few exceptions. Looking at the raw sentiment data, Trump was generally in the lead as the “least unliked” candidate. In other words, for the duration of the debate, both candidates held a sentiment score below zero, meaning that, in the aggregate, there was more negative discussion than positive about both candidates. In fact, neither candidate, at any point in the debate garnered enough positive sentiment to outweigh the negative. Raw sentiment data shows Trump in the lead for most of the debate. However, his lead does break from the first debate's trend in its overall strength. As the data shows, he even ceded his lead at times during the discussion of each candidates' character, during the discussion on Syria, and for part of the discussion on country unity. But as you’ll recall from our last debate recap, tweets about Donald Trump outpaced tweets about Clinton more than 2 to 1. This time around, that still held true and Twitter was talking about Trump more than twice as much as it was talking about Clinton. So we asked our friends at Cognovi to pull the normalized readouts as well, and the results are quite different, and, in fact, mirror the trend we saw last debate. Once normalized for the imbalance in volume, on balance, Clinton led as the least unliked candidate, losing the lead only at the very outset of the debate, as well as momentarily during the discussion on character, Syria, and country unity. 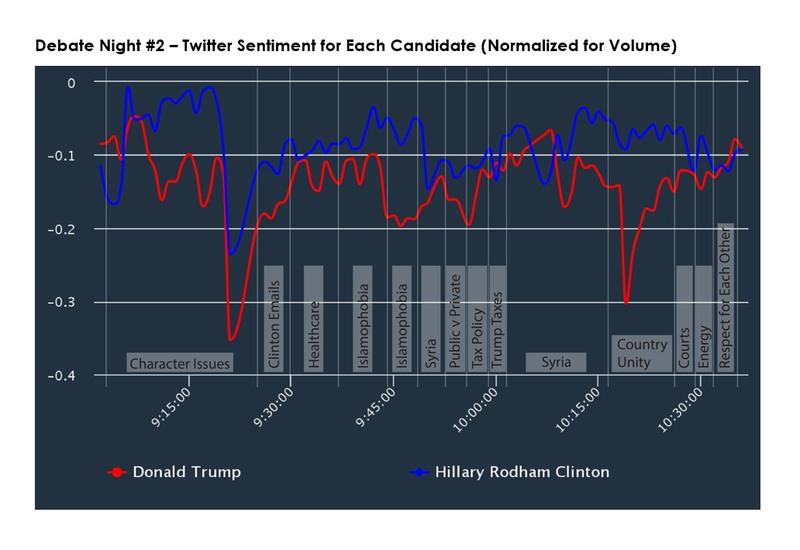 In both scenarios, whether statistically adjusted for volume or not, both candidates took a sentiment hit during the latter part of the discussion of their respective characters, and Trump’s sentiment took another dive during the discussion on country unity near the end of the debate. Because of this difference, we’ll continue to monitor raw sentiment as well as sentiment normalized for volume, and track what that looks like against other indicators, and eventually, the election’s outcome. Another curious point of data, similar to the insights from the first debate, is that even when the data is normalized, and the award for better debate performance switches to Clinton, we see the sentiment lines change places again, once the debate has ended. We’re wondering if this means that those Twitter users, lighting up the social media platform predominately DURING debate events are the more likely Twitter users to vote. This is another factor we’ll be monitoring in our analysis of how Twitter maps onto the electorate, and how Twitter chatter might be used to gauge a candidate's election successes. Stay tuned for more analysis and don't forget to follow us on Twitter at @apri_wsu for live debate coverage, as well as our friends @CognoviLabs and @Knoesis.